We’re more than sure that you’re fully across everything that is the humble waffle, but just in case, let us introduce you to the pancake’s crispier, more cross-hatched, more square (although sometimes round) friend. Here, you’ll find Melbourne’s best waffles. As you can imagine, Melbourne venues are all over the waffle. They’re putting together sweet waffle combos, they’re putting together savoury waffle combos—but there’s one thing we can confirm, any variation is delicious. So, without further ado, here are Melbourne’s best waffle dishes. Mr Sister's Peanut BUtter & Jelly Waffles might sound like a monumental dish to take on, but let me tell you, it’s not as sweet and heavy as you’d think. There’s a ton of food here, the waffles are delicious, the peanut cream is amazing, and the strawberry jelly, along with the crushed peanuts all come together in one amazing waffle dish. What’s better than 1 waffle? A whole bloody stack of them. The crew at Grand Trailer Park even give you the choice of peanut butter, Nutella or raspberry parfait to add to your stack along with freshly whipped cream, fresh strawberries and a drizzle of matching sauce. We’ve well documented how great the Chicken & Waffle burger at Gorilla Grill is. What an amazing idea to throw a bit of fried chicken in between two crispy waffles with bacon and spicy mayo. It’s the perfect dish for breakfast, lunch, or dinner. Heading into savoury territory is Elsternwick’s Penta, whose braised beef cheek is an absolute winner, and the sweet potato waffles just add that extra crunch you need when you’re tearing into a hearty breakfast. You wouldn’t think that you can improve on the apple pie, but the team at Mixed Business have definitely given it a red hot crack. Their Apple Pie Waffles are buttermilk waffles that arrive with maple baked apples, a pecan crumb, and it’s all topped off with ice cream. A staple of the good ol’ U.S of A, chucking a bit of buttermilk fried chicken on waffles is one of the better meals you can enjoy. 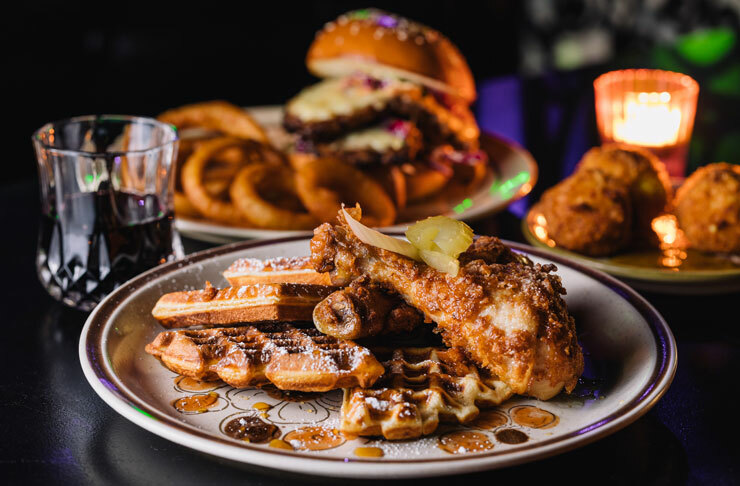 Fat Chance Hotel serves up delicious crispy fried chicken coupled with the extra crunch of the waffle makes this dish outrageously fun to eat. What you’re going to get here is a buttermilk waffle, topped with apple, and then some magnificent salted caramel sauce and vanilla ice cream. It’s about as perfect as a dessert can get. The great thing about F.A.T Fried & Tasty is that you can also get Chicken & Waffles, and waffles on their own. Magic. The Hong Kong Egg Waffles at Baba Sus should need no introduction given you’ve probably seen them blowing up your friend Instagram (grab a peek here). The unique egg waffle is folded, and is filled and topped with berry compote, vanilla custard, pistachio praline and green tea ice cream. Delving into savoury territory is the Duck Waffle from Cumulus Up. You’re going to get a buckwheat waffle with fois gras and prunes. Definitely an option if you’re not looking for something sweet. Another great savoury option is the Polenta & Cheddar Waffle from Fourth Chapter. Here you’ll find a delicious savoury waffle topped with ham hock, poached eggs and avocado hollandaise. Turkish Delight fans, you are in luck, because Phat Milk are dishing up these magnificent Turkish Waffles. The waffles come with smokey pistachio, coconut yoghurt, Turkish delight boozah, fresh berries, strawberry rhubarb compote, and topped with Persian fair floss. We are all in. While we're on the subject of sweet things, why not check out Melbourne's best doughnuts?